Nader Shah (King Nader), the founder of Afshar dynasty, ruled from 1736 - 1747 A.D. Nader Shah's tomb and museum is located in a beautiful garden setting at the heart of the city. It is a major tourist attraction and is located less than a mile north of Imam Reza's Haram (Shrine) at a major intersection. 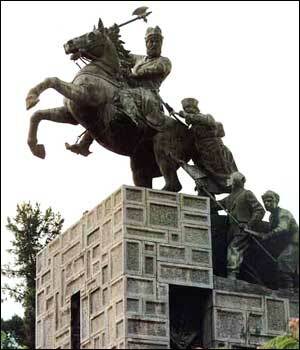 Nader Shah, is an enigmatic figure in Iranian history. Although he restored national independence and effectively protected Iran's territorial integrity at a dark moment of the country's history, his obsessive suspicions and jealousies plunged Iran into political turmoil, and after his assassination in 1747 the Afshar dynasty he established proved short-lived. A Sunni by upbringing, he was nevertheless a great benefactor of the Shrine of the Imam Reza in Mashhad, which he made his capital. Nader Shah (1688-1747), often called the "Napoleon of Iran," the 18th-century bandit leader Nader Shah created an empire that stretched from northern India to the Caucasus Mountains. Nader Qoli Beg was born in Kobhan, Iran, on Oct. 22, 1688, into one of the Turkish tribes loyal to the Safavid shahs of Iran. In 1726, as head of a group of bandits, he raised an army of 5,000 to help Shah Tahmasp II regain the throne the shah's father had lost four years before. Success in battle brought the bandit power enough to restore the shah and then depose him in favor of the shah's infant son. When the son died in 1736, Nader had himself proclaimed shah. Shah Tahmasp II's victories were achieved by his general Nadir Qouli (1736-1747), and when he attempted to lead an army himself against the Turks he lost large tracts of land to them within a month. Nader returned to Isfahan, took Tahmasp prisoner and exiled him to Khorasan, placing Tahmasp's eight month old son on the throne, investing him with the title of Abbas III (1729-1736), and assumed the regency. He recovered all the land lost to the turks, resotring the frontiers to their condition prior to the Afghani interregnum. On March 31st, 1736, following the somewhat opportune death of Abbas III, he accepted the offer of the throne, on condition that Shi'ism be dropped as the official state religion. This was probably as much to make peace with the rest of the Islamic world, in particular Turkey, as it was to mark the formal end of the Safavid dynasty. At first Nadir's reign was marked by great successes and liberality, in particular a campaign against India from which he returned so wealthy that he was able to suspend all taxes for three years. during this campaign, his son, Reza Qouli, on hearing a false report of his father's death, had Tahmasp executed. Later he was blamed for a failed assassination attempt and Nadir had him blinded. Reza said "It is not my eyes you have put out but those of Persia". Nadir seems to have bitterly regretted this action. Fifty noblemen who had witnessed the blinding were executed on the grounds that they should have offered up themselves instead, and he became increasingly paranoid, ordering the assassination of large numbers of supposed enemies. At length in 1747, he was assassinated by the captain of his guard at the age of sixty-one. Nadir Shah is thought to be responsible for commissioning the large paintings which hang on the Western wall of the palace of Chehel Sotoon in the city of Isfahan. He was followed by his nephew 'Ali, who took the title of Adil Shah. He had Reza Qouli along with all but one of Nadir's sons and grandsons executed, sparing only Shah Rukh who was fourteen. He in turn was toppled in a coup by his brother Ibrahim Khan who blinded Adil Shah. Ibrahim was almost immediately deposed and murdered by his own troops and Adil was put to death at the same time. Shah Rukh was put on the throne, deposed, blinded, reinstated deposed and reinstated again. During this time every provincial governor of consequence declared independence and the country was plunged into anarchy, leaving the way open for Karim Khan (1753-1779) to assume the reins of power and start the Zand dynasty. In summary, Nader Shah was a cruel and ruthless king whose harshness toward his subjects became more pronounced the longer he was in power. The extravagant cost of his wars drained the treasury. His attempt to turn his subjects from the Shi`ite to the Sunni form of Islam cost him what little popularity he had. He was assassinated in June 1747.